I’m very lucky to have access to great technology that is designed to measure what is happening in the golf swing. I have at my fingertips a huge number of different metrics that help inform my decisions around how I am going to teach my student. But this wealth of data doesn’t much if it can’t be translated back to a feel for the player. And by feel I literally mean a method by which I can help the individual develop a kinesthetic feedback loop for when they are performing a particular movement in the correct way. 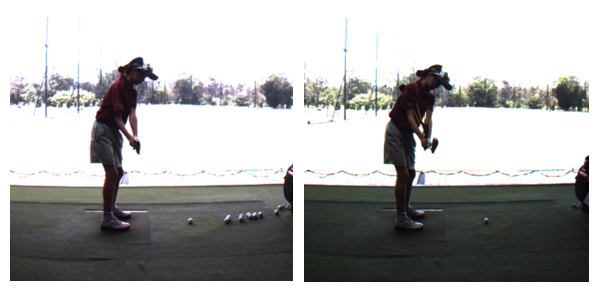 After all, when they have left the teaching bay and practicing on their own, Trackman and K-Vest aren’t going with, at that point it’s up to them to figure it out for themselves. I consider the establishment of that feel, feedback and response as the bridge between teaching and coaching. Gathering data on the movement, interpreting the information and re-laying that to the player in terms they can understand; is teaching. Giving them the ability to go away and work out how to ingrain that movement then apply it to different scenarios; is coaching. Before I go on to elaborate on how I do this, it’s important to explain a particular belief and use that as the example to illustrate my point. For me, posture in set up and the initial part of the takeaway are very closely linked to the quality of movement in the swing. If the player gets set up and takeaway wrong, then they better be really talented and a great compensator to achieve a decent ball striking outcome! My main priority when it comes to set up is having the t-spine and scapulae (shoulder blades) properly organized. If these structures are set right, then they can interact really well throughout the movement. If they are set wrong, things can get off track really quickly! Set up and initial takeaway are also some of the easiest things to train, because the movement is relatively slow and there aren’t many forces present. 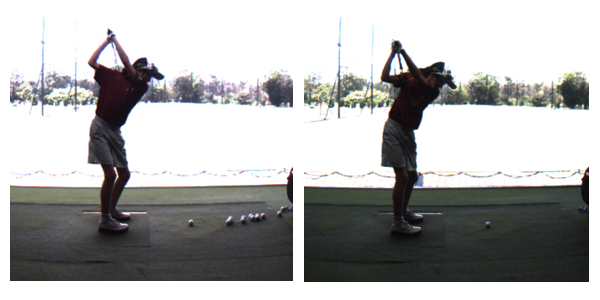 This is in contrast to training downswing movements; it’s at high speed and the forces / torques that have been generated earlier in the action largely dictate movements. The mini case study I’m going to present here features a 10 year old girl who made some pretty amazing changes in a single session. The ‘before’ and ‘after’ images below help to document the improvements in movement quality and control, the device she is wearing in ‘after’ photos is a GravityFit TPro, more on that later. First up, the 3 TPI screens I used were Pelvic Tilt, Dissociation and Shoulder External Rotation. She failed the Dissociation test, so I had a pretty good idea that she was going to struggle to stabilize her lower body whilst driving rotation from the T-Spine / rib cage. This idea was further validated when I saw her set up to the ball, in the ‘before’ picture she displays the classic set up posture mistake of having poor scapula position (evidenced by the shoulders sitting forward, especially the right). This position makes it very hard for her to make a connected turn, essentially the torso and the arms are going to operate on their own terms and struggle to match up when it comes to impact. 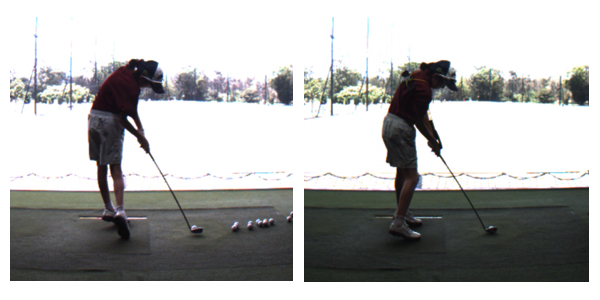 The images below are at the initial takeaway position, club parallel to the ground. 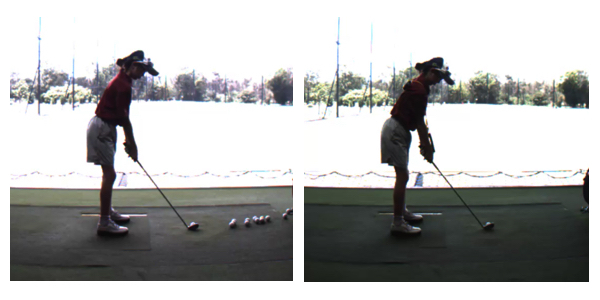 Whilst subtle, you can see on the left that the body and arms have started to move independently of one another. Whilst on the right we see a better matched up movement. This chain reaction continues, the fault becomes more exaggerated and differences in the movement more apparent as we continue up to the top. On the way down we see the club getting very stuck behind as opposed to more out in front. Until finally we come back to impact and see an incredible contrast. 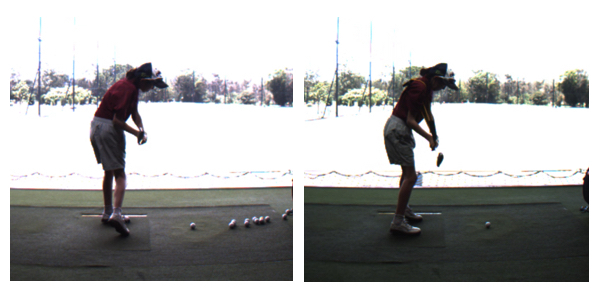 A key component to eliciting the change was the device she is wearing in the ‘after’ swing. The GravityFit TPro essentially provides kinesthetic feedback on TSpine posture and scap position via the backbow, whilst the tubing provides axial load to stimulate the deep stabilizer muscles that connect the scap / shoulder to the torso. 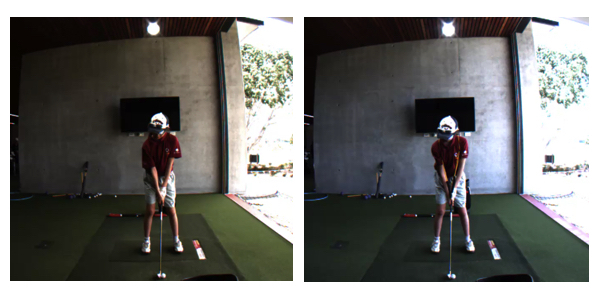 It also gives powerful feedback for how the arms and body are interacting and encourages the user to push out against the bands, creating width in the backswing and maintaining radius down and through impact. Because the TPro provides all of that stimulus and feedback, I can reduce my input around body movement and instead on focus on delivering coaching cues that are related to the outcome. 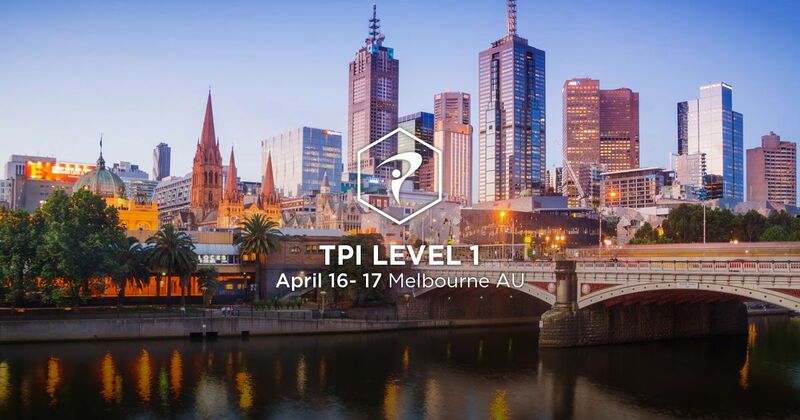 For more information on the featured product, check out gravityfit.com/golf and be sure to use the code MyTPI to access a 25% TPI Alliance Network discount. Nice article, great illustration of the before and after. Thank you so much for all of this valuable information!!!! Great article and demonstration from your student.